Seth Thomas Seven Jeweled Eight Day Ships Clock. Wind up clock works great and bell rings on the half hour and hour. On the back of the clock it has a tag on it from Larsen Nautical Clocks and Instruments Seattle Washington with a number on it "R-903232 up above it is scribed 10/49. I'm guessing that to be 10th month of 1949. Don't know if I should open the back 2 inch peep hole for more info. I would love to know more about the clock, like who the first owner was and the value of the clock now and if the base is original. 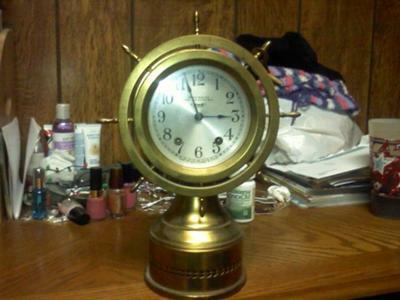 I haven't been able to find any pictures of a clock that looks like this one as far as the clock and base.